The manipulation and processing of stereo image sequences demand higher costs in memory storage, transmission bandwidth, and computational complexity than of monoscopic images. This chapter investigates scenarios for cost reduction by using reversible watermarking. The basic principle is to embed some data by reversible watermarking instead of either computing or storing/transmitting it. Storage and/or bandwidth are reduced by embedding into one frame of a stereo pair the information needed to recover the other frame. Computational complexity is reduced by embedding the disparity map. The cost of extracting the embedded disparity map is considerably lower than the one of computing it. Experimental results are provided. Watermarking is the imperceptible hiding of information about a certain digital work (image, sound, text, etc.) within that work itself. Watermarking is notoriously used to increase data security (by copyrighting, fingerprinting, authentication). Besides the increase of security, watermarking is also used to provide a transmission channel associated with some given data. The watermark becomes annotation data whose insertion in a host is meant to increase the value of the host. The range of possible applications of annotation watermarking is large. For instance, information related to the content of images can be embedded to facilitate content-based indexing, retrieval and manipulation of digital images and image regions. As for any other kind of images, copyrighting, fingerprinting, authentication and annotation are of interest for stereo images, too. 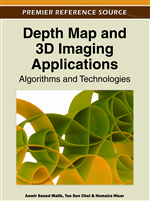 This chapter investigates the use of reversible watermarking in certain annotation applications meant to reduce costs associated to stereo image manipulation or processing. These costs refer to storage, bandwidth or computational effort. We remind that stereo images are sequences of two or more images of the same scene taken from slightly different viewpoints. Obviously, compared with monochrome images, stereo images demand more space for storing and a larger bandwidth for transmitting. Furthermore, three-dimensional (3D) information is usually recovered from two-dimensional (2D) images by matching features in scenes observed from different viewpoints. The cost of the 3D information, besides storage or transmission, demands computational effort as well. The basic principle of our approach is to embed data, by reversible watermarking, into stereo images. First of all, a scheme of high capacity reversible watermarking is introduced. The use of reversible watermarking in stereo is motivated by two aspects: reversibility and capacity. The reversibility allows, after the extraction of the embedded data, the recovery of the original image without any distortion. Nowadays reversible watermarking algorithms provide enough embedding capacity to deal with real applications. Thus, for natural graylevel images, the embedding bit-rate is of 2-3 bits per pixel. The reversible watermarking is fragile. This means that the embedded data is lost even in case of simple image processing tasks as histogram modification, contrast enhancement, filtering, image resizing, lossy compression, etc. On the other side, the embedded information adds some more value to the data and the user has no interest to destroy it. Therefore, if necessary, such image processing tasks should be performed only after the embedded data has been extracted. As an immediate application of reversible watermarking in stereo imaging, the embedding of the disparity map into stereo images is discussed. Thus, ground truth disparity maps are embedded directly into stereo images, instead of being stored and transmitted as additional files. Furthermore, the disparity map is crucial for computing 3D information. Instead of either computing or storing/transmitting the disparity map each time the 3D information is needed, it is simply extracted from the embedded watermark. The mathematical complexity of reversible watermark embedding and extraction is considerably lower than the one of computing the disparity map. The quality of the embedded images is good. Furthermore, the reversible watermarking can be reverted in order to exactly recover the stereo images. The embedding of the disparity map by reversible watermarking is discussed also in Khan et al, 2009, Ali & Khan, 2009. The main contribution of the chapter is storage/bandwidth reduction for stereo images. For a pair of stereo image frames, the basic principle is to embed into one frame the information needed to recover the other frame. Thus, only one image is stored or transmitted and its content is directly accessible. The bandwidth and the storage size are halved, i.e., they are reduced to the ones of monoscopic images. When the stereo context is needed, the embedded data is extracted and the second image of the pair is recovered. The reversible watermarking allows the exact recovery of one image frame. The quality of the other frame depends on two features: the size of the information needed to be embedded and the distortion introduced by the watermarking. The chapter ends with a general discussion on the use of watermarking in stereo imaging. The strengths and weaknesses of reversible watermarking for complexity or storage/bandwidth reduction are presented. Further extensions are investigated, as well.